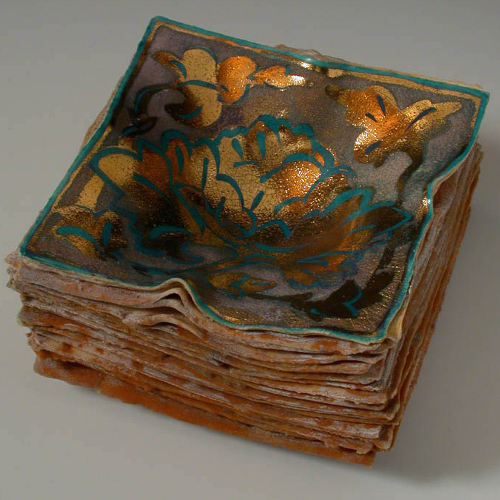 Created in 2003, this piece, entitled Memory Pillow, features a lustred floral motif. This artwork was made for the invitational exhibition, To Dream the Impossible: contemporary ceramic pillow exhibition at The Pottery Workshop & Showroom, Hong Kong and Shanghai, China. "Memory Pillow grew from the challenge of the exhibition theme to marry the notion of the Chinese ceramic pillow-form with my own work. As a result of this struggle I found that my research lead me to investigate Sung dynasty pillows and the imagery that they carried. Memory Pillow gathers in the idea of unwritten histories, in particular women's stories and glosses over it with the beautiful 'peony' motif that according to my research is the symbol for a happy life and good marriage."